Ignatius Piazza: Starbuck’s Employees Just Got a Bonus! Evidently some whining handwringers saw customers of Starbucks, Peet’s Coffee and California Pizza Kitchen openly carrying handguns and alerted the two organizations that violent criminals love most–Handgun Control Inc. and the Brady Campaign to Prevent Gun Violence–to do something about it. 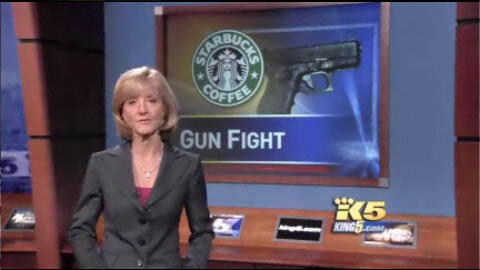 You know the drill… Sarah Brady types parade a bunch of kids around, pull exaggerated and unrelated gun death statistics out of thin air and claim if guns are allowed in coffee shops people will start killing each other over who was in line first for a cup of java! These unenlightened gun-ban advocates do nothing other than create more “disarmed victim zones” for criminals and terrorists to gleefully attack without resistance. Well, Peet’s Coffee and the California Pizza Kitchen refused to recognize local, state, federal and historical statistics that prove arming citizens actually deters violent crime. Instead, they were suckered into banning guns in their establishments. Too bad for them. I’m sure millions of gun owners have already found safer places to drink coffee and eat pizza. Starbucks on the other hand, made a rational, logical and well researched decision to allow guns in their establishments. As a result, I’m sure Starbucks will see a significant increase in their business and I am giving every employee of Starbucks a nice bonus in anticipation of their increased work load! Again, congratulations to the Starbucks organization for making the wise and rational decision to uphold law abiding citizens’ right to carry a firearm. The country is truly safer when law abiding citizens are armed in public places. To thank the Starbucks’ organization for setting a stellar example of proper corporate policy, I will provide a $2,000 bonus to every Starbucks’ employee in the form of a Front Sight Four Day Defensive Handgun Course. All a Starbucks’ employee has to do is select a Four Day Defensive Handgun Course date in 2010 from our website course schedule at www.frontsight.com and complete the Course Application. (We run the courses almost every weekend except during July and August.) After completing the Course Application, attach a copy of a current Starbucks paystub to the application instead of the $2,000 course fee and mail the completed application so we receive it at least two weeks before the course date. We will then place you in the course and e-mail your course confirmation materials. And if you are not a Starbucks employee, don’t despair. You can receive an amazing opportunity when you take advantage of the Greatest Course, Gun, and CCW Permit Offer in the firearms training industry. You will receive training that exceeds law enforcement and military standards without any boot camp mentality or drill instructor attitudes.